← Two New U.S. – China WTO Decisions — Who is the Biggest Winner? National Interest, International Relations and International Law — Is Power Politics Dead in this Era of Globalization? The simple answer is that power politics is not dead in this new era of globalization. Yes, we have new rules for inter-state relations brought about by globalization. But calculations of national interests in foreign policy decision-making is done throughout the capitals of the world. The calculations vary and new global rules have not fully evolved or accepted by all. The tensions between economic interdependence and regional relations are still playing out. Most importantly, as the crisis over the Ukraine and the Crimea illustrate, the clash of newer global rules with older national concerns is unsettled. The new international political system is a work in progress. The era of pre-World War I globalization died in August 1914. This new era of globalization in the early 21st Century is confronting critical challenges. As we approach this August, the one-hundredth anniversary of the outbreak of the Great War, we need to pause and reassess the interplay between national interests, global rules, and globalization. No outcome is historically mandated. Good policy and good leaders will make the difference. ….. “21st-century Power Politics.” Washington Post (March 28, 2014). 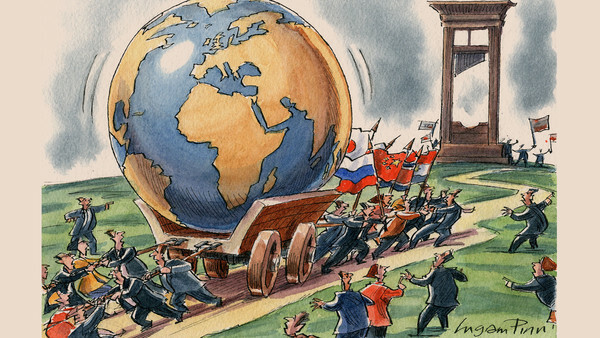 ….. Article.Globalization — Best of Times (FT 3.26.14))” Financial Times (March 28, 2014). This entry was posted in Global Trade Relations and tagged 19th century and 21st century rules, Crimea and Ukraine, economic interdependence and peace, Globalization in early 1900's and early 2000's, international law and international relations, national interests and new global rules, power politics and globalizaton, regional relatoins and global interdependence. Bookmark the permalink.